Hello People!!! Hope you had a great holiday! So please bear with me for just that bit longer... After The Platform 10.2 (and I just have to tell you about that... now I completely understand and appreciate the importance of maintaining a consistent online presence even more. How do y'all like my flyer?! :-D :-D :-D Yup! I created this myself. Very basic and yes it took me all day but I finally managed to ace it. Phew! And I am mighty proud of myself! After all the challenges I had with the FEC flyers, I just thought I needed to save myself the hassle and work with what I had to develop what I wanted. 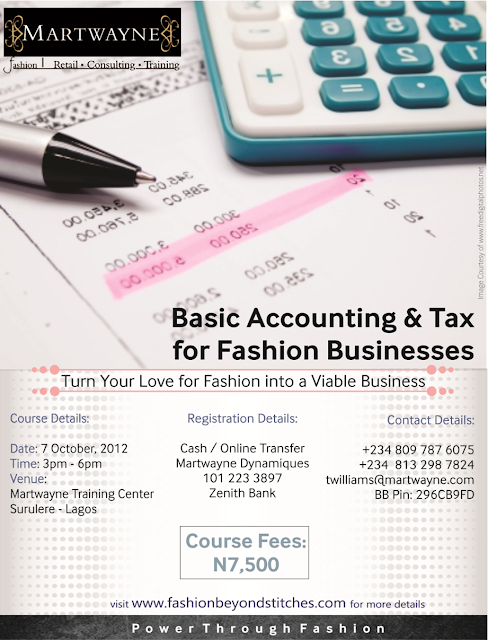 Finding it difficult to track your finances or keep basic accounting records for your fashion business? Then you must attend our next Course titled: "Basic Accounting & Tax for Fashion Businesses". Like our other courses, payment of the fees via cash or online transfer into the "Martwayne Dynamiques" account, 101 223 3897 at any Zenith Bank branch secures your seat on the Course. For more details, please contact +234 809 787 6075; +234 813 298 7824; twilliams@martwayne.com (please cc. xxaaviere@gmail.com) or chat to me on BB, PIN: 296CB9FD. Short and straight to the point right?! I am learning... Do send an sms or BB message to the numbers provided when you register for the Course so I can send you the details of the venue. Great! Thank you so much and I look forward to you attending the Course on the 7th.